The FAQ section is under construction. It may be some time before all the questions get answered. Feel free to add more questions. What is Islam and what is a Muslim? Isn’t Islam a ‘foreign’ religion? Most Muslims live in the Middle East right? This is misconception that a lot of people have. Although Islam originated in the Middle East and the Arabs, Turks and Iranians are majority Muslims, followers of Islam are found throughout the world. Thus for example the largest Muslim country is in South East Asia – Indonesia. As for regions, South Asia (Pakistan, India and Bangladesh) have the largest number of Muslims in the world – more than 400 millions! Islam in China is almost as old as Islam itself. In fact there are more Muslims in China than there are in Most Arab countries. So Islam is not a foreign religion. It is a universal religion with many ethnicities and groups. How many Muslims are there in China? There does not seem to be any consensus on this number. Most estimates range from as low as 10 million to as high as 100 million Muslims in China. However the figure of 25 million Muslims seems more plausible. Are there Chinese Muslims in other countries? Yes there are Chinese Muslims in Central Asian countries and also in Malaysia. In Central Asia they are known as Dungans and still maintain their identity as Chinese Muslims. Almost all of these sought refuge in the Russian Empire during the Hui Minorities War in the 19th century. The Chinese Muslims as a community has arisen and disappeared in Malaysia a few times in the past. Either they were absorbed by the majority Malay Muslims and became Malays over time or they were absorbed by the non-Muslim Chinese and lost their beliefs. The recent growth of Chinese Muslims in Malaysia is an exception. There are more than 50,000 Chinese Muslims in Malaysia. Do all Chinese Muslims belong to the same group? No. Out of the 56 officially recogonized ethnic groups in China 10 are predominantly Muslim. These are Hui, Uyghur, Kazak, Dongxiang, Kyrgyz, Salar, Tajik, Uzbek , Bonan, and Tatar. Who are the Hui Muslims? Although there are 10 ethnic groups in China who are predominantly Muslims, two groups form the numerical majority. These are the Hui and the Uygar. Hui Muslims are the descendants of Arab, Persian and Turkish Muslims who intermarried with the local Han Chinese people. There are around 10 million Hui Muslims in China. Their culture is the same as that of the majority Han Chinese with the difference that the Hui practice Islam and thus don’t eat pork or drink alcohol. What is the relation of Hui surnames to Arabic and Farsi names? Some of the Hui surnames are derived from Arabic and Farsi names. Thus the following names used by Chinese Hui Muslims have their origin in Arabic and Farsi. Who are the Uygar Muslims? What is the difference between a Han Chinese and a Hui Chinese? Historically speaking other than the practice of Islam there is not much difference and even this distinction is no longer applicable. For some Huis being a Muslim is like belonging to an ethnic group and thus their knowledge of Islam is practically non-existent to the point that they do not even know the basic pillars of Islam and yet they consider themselves Hui. On the other hand there are recent Han Chinese Muslims who follow Islam much more than the Hui but they do not like to be called Hui because they are of pure Han Chinese blood. In terms of lifestyles the two groups are almost identical. Places where they live side by side they speak the same language. Even amongst the Hui one will find people who eat pork and drink so its difficult to tell where the Hui begins or the Han ends. How much of old China, in the pre-modern sense, exists today? What are the names of the Chinese Sufi Orders, and who are their Masters and Shaykhs? How is strong is the legacy of Chinese Muslim martial arts in China today? Is it difficult to find masters of this art/science, particularly for foreigners? Where in China are there universities, institutes, teachers etc that teach the history of Islam and China – in its language, culture etc? Where in China are Muslims mostly located? When did Muslims first came to China? What is the history of Islam in China? Who are the famous Chinese Muslims? How many Chinese Muslims live outside of China and in which countries? What languages do Chinese Muslims speak? What is the general perception of Chinese people regarding Islam? What is the status of the dawah in China today? What is the future of Islam in China? R U A PRO-CHINESE HUI MUSLIM WHO SUPPORT THEIR ASSIMILATION POLICY????? i AM A DUNGAN (HUI MUSLIM) LIVING IN KAZAKHSTAN AND I REMEMBER THE STORIES MY GRANDPARENTS TOLD ME ABOUT THEIR ESCAPE FROM CHINA AND WHAT DIFFICULTIES THEY HAD TO FACE. PLEASE LOOK AFTER WHAT U R SAYING, HAVE RESPECT TO US. what are some good books on china and islam? I’m American Muslim businessman. I will be travelling to China in April to attend Canton Fair. I will also be travelling to different parts of China to visit textile factories to import Home Textile ( All types of Towels, Bed Sheets,Bedspread/ Comforters set etc ). On my trip I like to see Islamic history and visit mosques and meet muslim chinese as well. I would also appreciate to hear from Chinese muslim business persons with any ideas to do business between USA and China. Hi, I’m a Muslim and I’m currently living and working in China as an expat. I’m amazed by the number of Muslim restaurants I’ve encountered in the city where I work. It’s a small city by Chinese standards with a population of only 3 million people, but I have encountered 8 Muslims restaurants all within 5 minutes walk of my hotel!! I guess this shows just how many Muslims there are in this town. WHICH CITY IS THIS? As I am also intending to travel to china for business purposes I would also like to know where to come to as China is a massive country..
My dear Brothers & Sisters. country ( including Saudi also) follows Darul Uloom Deoband fatwa(Question – Answer). Deoband) in his Dream (Its written in Maulanas’ book). question, If you people want more information about Indian muslim, Islam in India or anything from India then plz mail me on (Ashrafkhan1986@yahoo.com). china is great contry.my regard to every chinese.i m very happy to know about my muslim brothers in china.i hope that u will follow holy quran and because of you ur contry and ur islam will bring peace n prosperity for humanity. To the brothers and sisters who live and work in China, How can I get to live and work in China as well? is there any way to get help to do so, I live in USA and would love to live and work in muslim China. If you can help in any way, please email me at mkaboulezz@gmail.com. I have heard that Muslims in China are under government pressure like in many other countries. I think Muslims must be more active and show their peace and kindness to all world, so they can contribute more in governing their countries. And Allah is with them, for sure. What i understood is that ur family is under pressure of masonic agenda of channeling spirits or ur family members.rite? I know its quite common.They (freemasons) take children alot for MK_ULTRA project purposes.All u need is to recite holy verses of QURAN everyday in early morning and at dawn.These verses are Ayat_ul_kursi, 4 qul (4 surah starting wd Qul) and surah Baqarah ‘s last ayat.Read them 4 u and ur family.No spirit or demon will ever touch u.Remember not to forget even for a single day.u ll b saved or refer to an islamic scholor for RUQYA( islamic way of removing demon and jinns). First of all, not Uygar, but Uyghur or Uighur. Your inability to spell indicates your (author’s) knowledge of us. Second (particularly addressed to the ones who wrote the comments above), open your eyes wider… China is a peace loving country? My people are facing brutal policies and persecution of the Chinese Government, hundereds are being executed. These are simply human rights and liberties activists who are opposing harsh Chinese policies. After the 11th September, Uyghur situation worsened, China started its campaign on crushing so called “terrorists”. At the same time, they are moving millions of Han Chinese to Uyghurstan to assimilate and incorporate the local population into their Empire. Tensions are huge there, what kind of peace and love are you talking about? They are Muslims, isn’t a muslim a brother to another muslim? Well, I do not notice any brotherhood and compassion here. Instead you are praising and supporting China, while Uyghurs are at the same time facing strict religious restrictions. Thank very much, you made me more confident that United States and Europe are our allies and friends in every sense. Please do not feel angry at the author of the blog I do not think he is praising China. It is obvious to any one that Muslims are being persecuted in China. It’s on the news – when they feel like mentioning it. So yes, it is swept under the rug about the human rights abuse going on there. I do hope things change and that China fails at it’s evil plan. My Duas are with you and your people in China. Author you are a real coward, sensoring, monitoring and controlling the messages before people see them…. I am writing to seek your advice if possible. I am presently residing in Pakistan with my family. The company I work for may be relocating me (along with my family) to Beijing, China. I may be there for about 3 years or so. Alhumdulillah my family and I are observant Muslims. I try and pray in the masjid 5 times a day and my wife does full niqaab (covers her face as well as entire body). We are also doing our best to raise our children to be the best Muslims possible. Of course my main concern in moving to Beijing would be the Islamic environment. Will my family and I be able to practice our Deen fully? Will there be a wholesome environment for my children? Will my wife be able to observe the Islamic dress in China? Is there a good Muslim community with whom we can establish close, friendly relations? We do not care if there are Pakistanis there or not… we feel the relationship of the Deen is most important. We are also home-schooling our children… I am not sure if this would be permitted in China. I am not sure if you even have such information… but any advice you could provide in this regard would be extremely appreciated. could you help me?i am intending to study in jinaan shandong.i need information on musjid close to jinaan medical university,halaal food and muslim house(purdah nasheen)for boarding and lodging.my mother is worried about my deen and living style so i would prefer to board near to the university. The important thing here is speed. The hotel management wants the whole visa process be settled within 25 days time. Omni Hotels are an Equal Opportunities employer and applicants from non-EEC countries will require work permits or permission to work issued by the Home Office………… The Omni Hotels is a wonderful place. The staffs are friendly and always happy to accommodate. If you can meet our requirement? Please reply for further procedures. The management will take care of your feeding, accommodation including your air ticket. We will provide some relevant back up documents to enable the applicant get his or her visa at Canadian-Embassy in the applicant’s Present country of residence; visa will be issued upon approval from Canadian-Immigration Visa Affairs Home Office. Omni Hotels Ltd: Registered in Canada : Registered Number 7343600. Allahuma bariklana fii rajab wa syaban wa balighna ramadhan. I am truly fascinated by the Hui community and how they maintain Islaam and yet share the same culture as the majority Han chinese. Mashallah. I am thinking about teaching English to Muslims in Ningxia province, does anyone know how I could arrange this…I have heard that there is a Ningxia Islamic Academy in China????????? I am a reporter for Newsweek in Beijing and am looking into writing a story about Muslims in China, especially Muslims looking to spread the faith. Are you still involved in Islam in China, and if so, would you be able to have a phone chat? My name is Muhammad Ata-ul- haq Sultani, You can call me Sultani, I am from Pakistan Karachi & working in Motor Company I want to meet chines muslims & become friends of them please guide me to seek knowledge about china my phone no is 00923003993360 & email address is i.m.sultani@hotmail.com if some one want to give their phone or mobile number please let me know & become my true friends. I’m a South African Muslim businessman. I will be travelling to China in April to attend Canton Fair. I will also be travelling to different parts of China to visit On my trip I like to see Islamic history and visit mosques and meet muslim chinese as well. I would also appreciate to hear from Chinese muslim business persons with any ideas to do business between S.A. and China. My name is Ansari an indian muslim , i will be visiting Fusha town , Zhong shan , Guangdong , I would like to know the mosques near by these places and also halal restaurants . I just want to find out is there anyway to get China Muslim to work in Malaysia and how to do it? Please advise. Asalaam-o- Alaikum wa Rahmat alla-he Baraka tuhu..
Greetings and best wishes to my dear Muslim Brothers and Sisters of China, and from all over the world who are visiting this site for their love of Islam. May the blessings and mercy of Allah be on you all. I am a humble Muslim from Bangladesh. I find this web site very informative and illuminating about the Muslims and Islam in China. Almost 30 years ago, I visited the shrine and a mosque at the grave of a Saint situated near the City of Canton. I have photographs of the place. It was then maintained individually by a few pious Muslims of Canton City- Allah bless them. I was taken to this holy site by a few brother businessmen from Bangladesh who visited it before. We took some copies of the Qura’n from Hong Kong and a few caps as our humble gifts for our Muslim brothers of Canton. Unfortunately, I have not been able to visit China since then because of many preoccupations since then. Inshallah, I shall visit China and Canton soon after this long gap. I hope it is well maintained and regular prayers (salah) are held at the mosque. I pray that more and more Chinese brothers and sisters come under the universal flag of Islam. I believe that Inshallah, there will be millions and millions of new Muslims from China to uphold and further the spirit of Islam. But each of us must do our duty in order to serve the cause of Islam in our own way. Even a small gesture in this direction will earn great rewards in this world and hereafter in the next world. So, we all should devote our time, energy and money, for the purpose of serving Allah as much as we are all able to. I request all Muslim Visitors to the City of Canton to visit the Mosque and Shrine and make generous contributions to maintain and protect this seat of Islam in China. We should send a clear message to the Muslims of China that we are all with them, we the Muslims of the World! We must stand united for this purpose. That is our duty. My name is Mohamed and I live in the united states of America and I am looking for a good Muslim Chinese woman for marriage so If you any one who can help me in that ,it would be appreciated. my email address is( musayahya@msn.com) please write to me as soon as you get this massege. Salam to all. DEAR MUSLIM BROTHERS AND SISTERS OF CHINA!!!!! and get unlimited reward from Allah !! I am very happy to visit this website and read the comments of the readers. I work in Saudi Arabia. These days many Chinese are coming to Saudi Arabia for Business purposes. I have given the link of this site to my blog. I hope I will be able to visit China, one day. Awesome work, i like what you did.good research. My name is syed i am from pakistan,karachi. I want know that there is any mosque in Rizhao city,shandong provence. thanks.Wa salam .Email me on syedfmb@yahoo.com. Im from India and got selected by a Chinese compnay to work in Shanghai. I may be there for about 3 years or so. My main concern in moving to Shanghai would be the Islamic environment. Will my family and I be able to practice our Deen fully? Will there be a wholesome environment for my children? Will my wife be able to observe the Islamic dress in China? Is there a good Muslim community with whom we can establish close, friendly relations? I feel the relationship of the Deen is most important. Assalamualaikum to my dear Muslim brothers and sisters in China! My name is Zaher and I’m looking to teach English in China one day soon. I am a qualified Singaporean teacher with teaching experience in teaching English in Singapore schools. If you like to study Quran online (with Tajweed rules) from a qualified teacher, then please contact us at http://www.quranFocus.com . Inshallah we will help you. My name is Amin Hamid from Kuala Lumpur, Malaysia. Is anybody out there can give some info pertaining to Muslim Scholar, university, community, institution, groups, club, mosque committee in Guangzhou to discuss on deviant teaching in China, rituals, discussion about Fatwa together with the Ulama’, the islamic law system, tithe (zakat) etc. 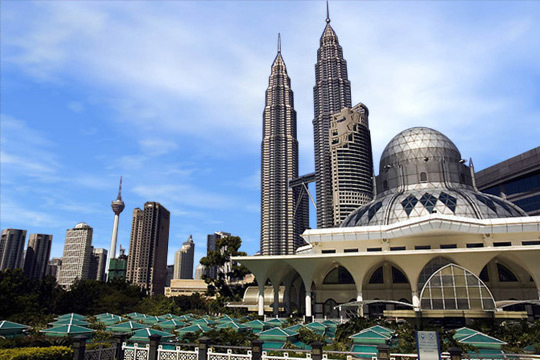 We plan to have a study trip of about 30 people from Kuala Lumpur in September. Appreciate your help. My god bless you all inshallah. I’m a Sudanese young women and I was researching for a character in my new novel , he is supposed to be a Muslim from Singapore but lives in Canada, and I wanted him to be from a Chinese decent with a Chinese name, yet I had no idea that Islam and ones origin is such a thorny issue in southern Asia! I am so happy because I can communicate even if only via email. I want to do the travel business for pilgrims from Indonesia and from china. is there a possibility to do this collaboration, for example pilgrims from Indonesia later pilgrims from china to meet together in mecca and part assembly needs to be prepared from china. I really hope there is my brother Muslim Ummah from china who are interested. My name is Mohamed. I am from Sri Lanka. I will be visiting the 112 Canton Fair from October 13- 18th. I am looking for new business ideas or ventures in collaboration with Chinese business firms taking part in the Canton fair or any others situated in Guangzhou or nearby. Please inform me all details of products and contact information and we could meet and discuss during my visit. Dear Brothers & Sisters Aslamualikum Rahmatullah. I am a Muslim Singaporean and I am shocked to observe what brutality being conducted by the Taleban in Pakistan. Brother and Sister my last visit to Mekkah for Umrah Ritual I observed Saudis conduct racist attitude to Asian National. In Madinah I stayed in 5 star hotel and observed they serve food for middle eastern Muslim different than Asian Muslim. Food quality was found lower to Asian Muslims. Most Pakistani Taxi Driver was found cheating shamelessly also observed road sweeper taking money from Saudi rich person who shows off his money to these poor people. Is Saudis 75% rich people follow Islam Teaching and take guidance from Al – Quran ? I used to know Indian Muslims are mostly greedy who try to cheat but I did not know Pakistani Taxi driver in Mekkah cheat humble Muslim come to KABBAH for Umrah Hajj ????? i am muslim and . . . . Anybody having ties with Islamic finance in China please get in touch with me. what do islamic people eat in china? i need your help please for my catering assignment (homework)! hi, have u done your homework? im actually doing this type of question too for my assignment. Search your “Life partner” belongs to Muslim community without any Cost. All Features are for Free of Cost!!! hi , may i know if the muslim in china practice the 5 principle of islam? assalamu aliakum.i’m ismail muhammad i’am nigerian and am happy to see that islam is in every were and in every nation.but my question is what are we doing to see that islam is sprayed all over the world? thank God islam is diverse… u have to be more literate and less ignorant in 21st century. Support us by downloading our free app from Apple store and Google play it’s hisabul Salah. We want to know what u think and if we can do better for the Muslims. Ramadan is a month of blessings and spirituality. It is considered as King of all Islamic months of whole year. Muslims are granted with an opportunity t grab maximum blessings by performing righteous deeds and asking for forgiveness for their sins. In order to gather maximum spiritual benefits of Ramadan one can set spiritual resolutions for upcoming whole year in order to set a schedule of virtues up to next Ramadan. assalamualaikum,,i want to ask ..is there any university in china offers on how to learn al quran (reading) please reply me… which university?? I am living in Ningbo and I want to meet Muslims community. Help me to find Community in Ningbo.